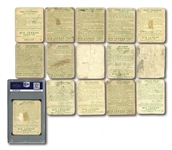 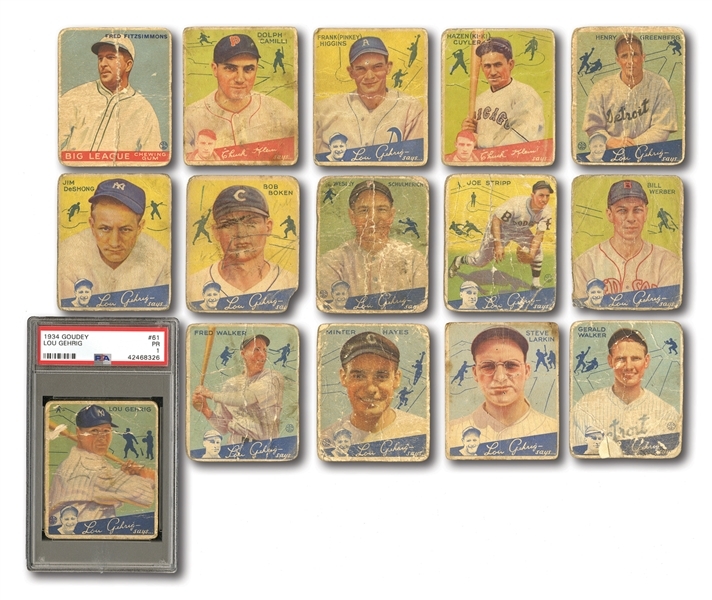 Lower grade lot of 14 different 1934 Goudey baseball with most cards appearing to be in the PR range. With all cards with multiple creases and some paper loss. 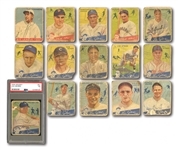 Players are: #26 G. Walker, 39 F. Walker, 46 Stripp, 54 Schulmerich(back is completely gone), 61 Gehrig(HOF) PSA PR 1, 62 Greenberg(HOF) PR(writing on back), 63 Hayes, 74 Boken, 75 Werber(back is completely gone), 78 Higgins, 90 Cuyler(HOF) PR, 91 Camili, 92 Larkin, 96 DeShong. Also included in lot is a 1933 Goudey - #130 Fitzsimmons PR.